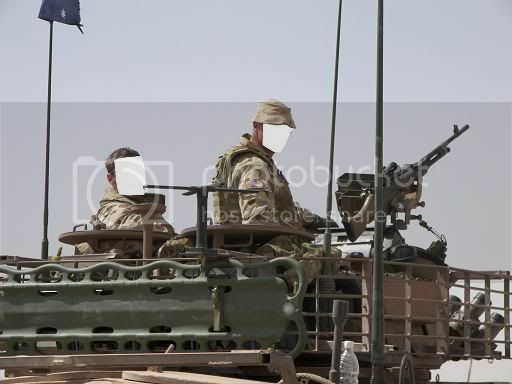 Couldn't have been recky mechs, any recky mech worth his salt should have told you to use them within their load limit, an ASLAV weighing X tonne has nothing to do with using something from an M113/Bradley etc. 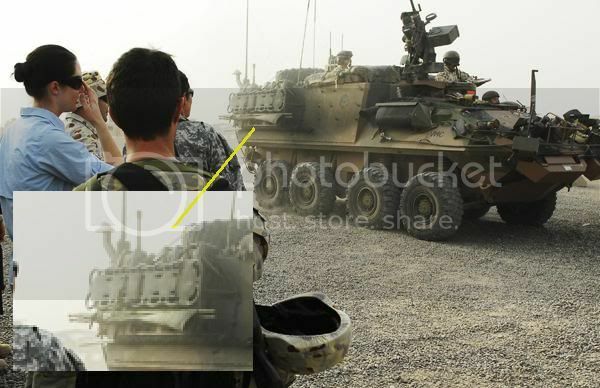 As for tow rope size yes the american gear is all the same design but, when you put a tank rope next to a M113 rope the latter looks very spindly. The rope itself is about half as thick and the eyelets are about half as thin. 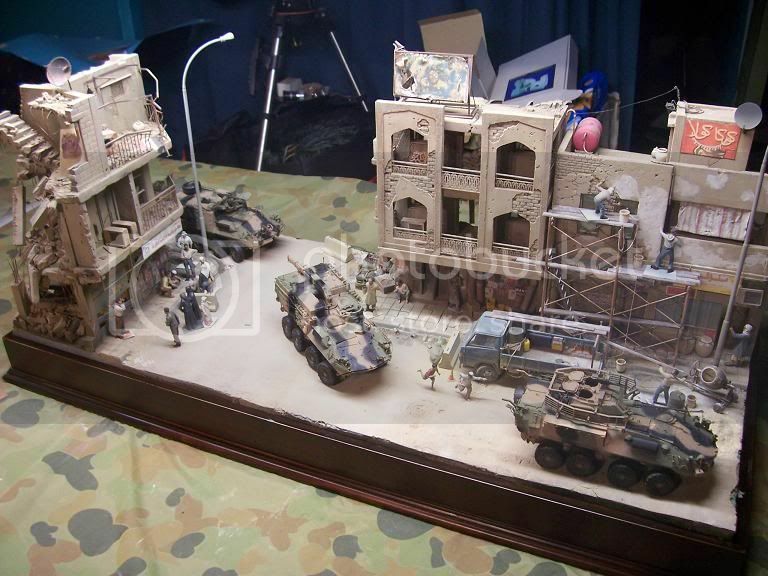 But in 1:35 scale you would probably need a magnifying glass to tell the difference. It wasn't the Rechy Mechs it was the Spanner Nazis MAS. The Rechy Mechs were more into rolling resistance etc. I didn't want to single anyone out cause I know how close you card carring union members are . In the words of SGT Oddball "I just ride them man. I don't know what makes them work"
And we breathe a sigh of relief. SO this is the wrng place for this update but I didnt blog the PC build. 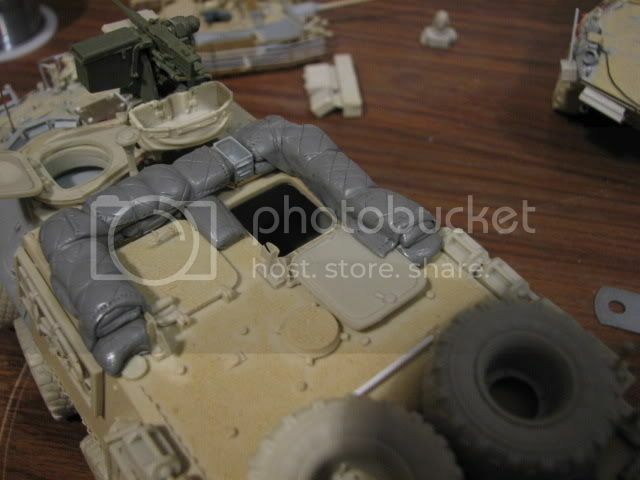 But I added spall liner wrapped sandbags to the turret this evening. A sort of last minuit thing as other things didnt pan out, but i am happy with the look. So to be clear I did two layers of sandbags around the supertructure as per reference pics in Sam Dwyers blog, and some others from the web. 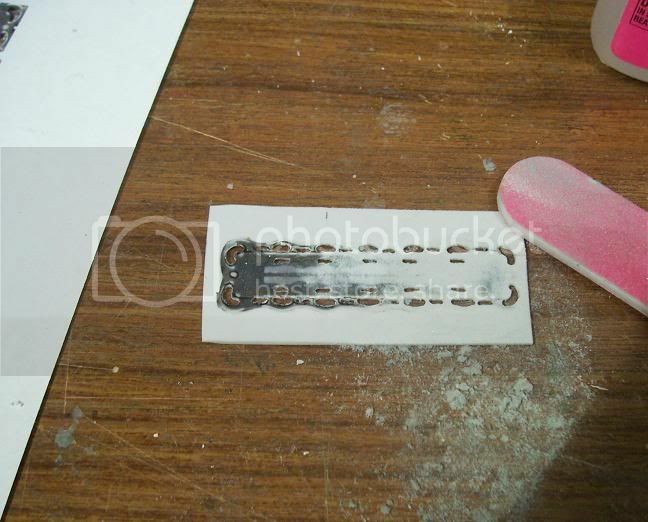 and then wrapped them with very thin layer of epoxy to make the liner. 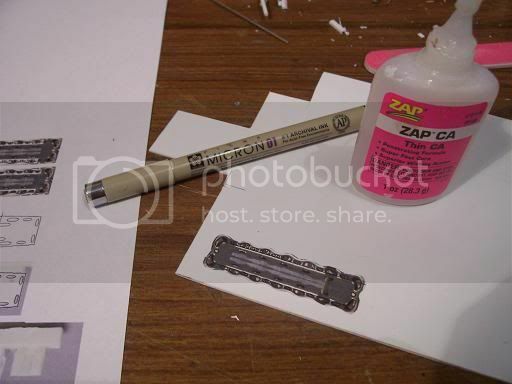 I used figure modelling epoxy as it has a really good work life time (and I dont have anything else on hand.. lol). Sandbags are made the traditional way with makig a sausage, cutting the bags and shaping by hand and pressing in place, the liners were made by usinga glass jar to roll the epoxy into very very thin seets, trim them square and add to the the bags. the I scribed the seams into the edges, and the quilted criss cross pattern in the rest of the liner. Anyways heres the pics. not real good pics but you get the idea. one last thing, I decided to have the 50 cal box offset to the side instead of on top of the bridge. No reason other than I like it to be a little different to the others ! 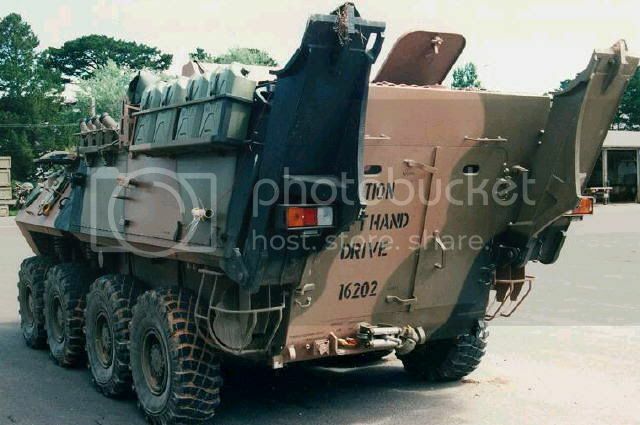 Now to see If I can find pics of this sort of thing happening on the fitters vehicle. So the white/opague item on the side rack just above the pioneer tools. 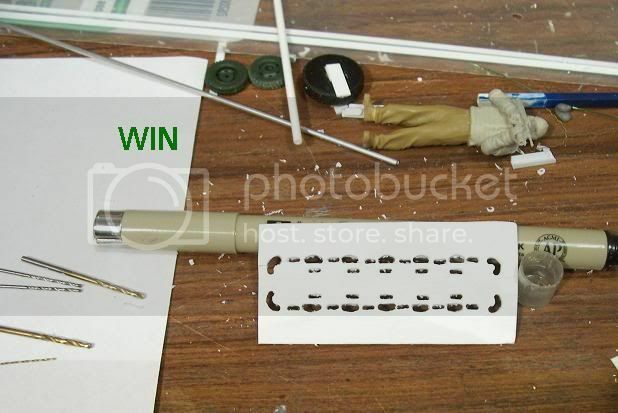 Looks like a washing up bin that we used and I am wondering what it represents on your kit and what it came from, so I can add one to my M1A1HA from GW1. Cheers. thats from my blog ? 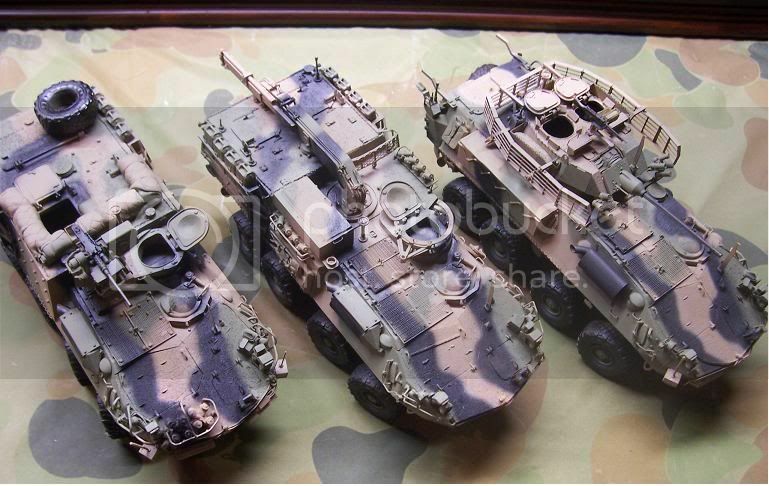 its not my ASLAV.. its too neat and clean and things look sanded and no glue.. lol. Im not sure where that pic coms from but it doesnt matter. EDIT just checked and thats Sams nice looking ASLAV, his pics he posted on the blog.. 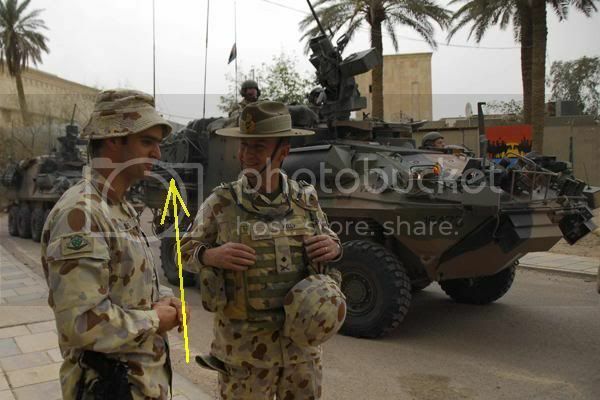 The washbowl can be found in an accesory set from mouse house - kit number MA317 Complete Equipment Schedule (CES) fr Australian AFV's. Nice set includes gas bottle, toilet roll, cups, gas stove portable, empty 50 cal liners, jaffle irons, duffle bag and so on. and another very important piece of kit - the connectors for slave cables! heres a link to item. The washbowl is what your talking about. 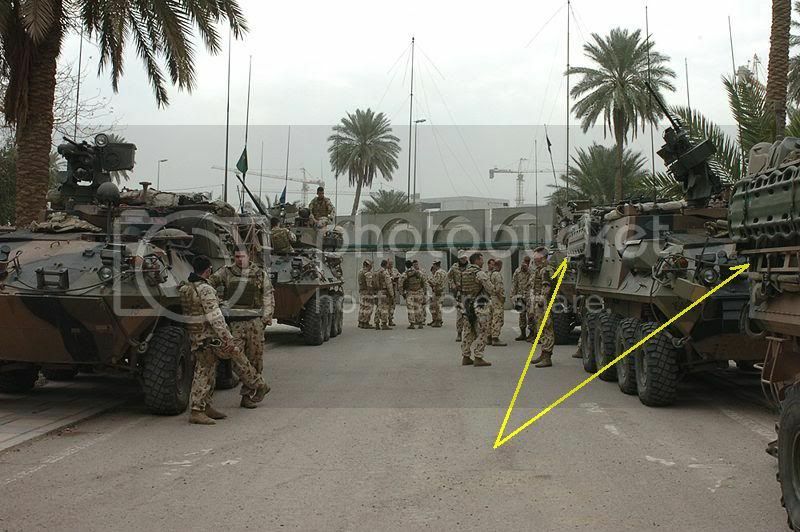 These LAV's look the business! 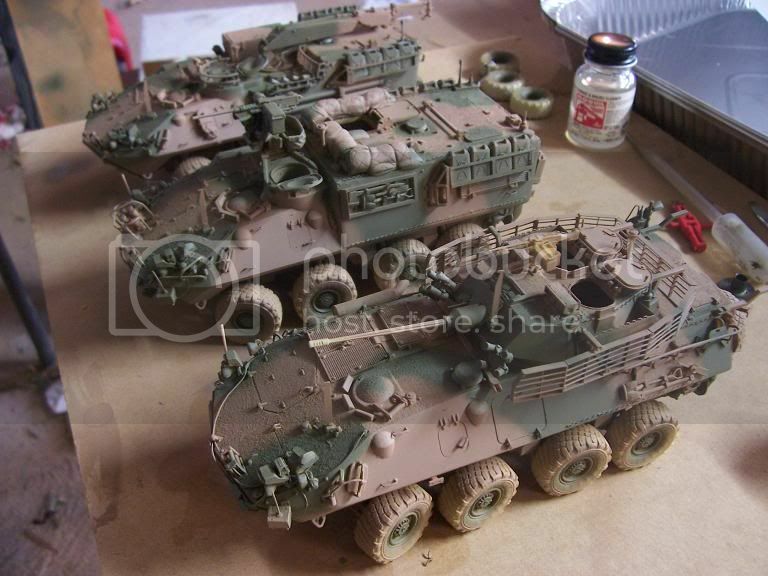 dying to see one in paint and weathered!!! Haha yeah, MAS, we (regular RAEME) probably hate them more than anyone else. Like Adam said the AM set from MH is nice. I picked up my set a few years ago when it first came out. The thing is only Tankies put their wash basin on the outside. Real Cavalry soldiers are a bit more discerning in that we normal stow it inside so that it is less likely to fill up with dirt. Tankies on the other hand are dirt magnets and don't mind washing in mud . No fall out. I placed the washing up basin there just for the images, the finished vehicle has a 25mm case and some vehicle tarps in the tarp rack. A wash basin is considered a luxury to most and since the M1 has very little inside stowage areas the basin almost always finds its way to the turret basket. Yeah yeah, rub it in Mitch, LOL. Bloody spanners and their campervans. Have you wired in the stereo and TV yet or are you still not allowed to make 'modifications'? I just layed the first coat on. Used The Mouse House Paints Auscam brown as a base coat. It sprayed on darker than I thought, then after it dried _ and quickly too - it was much lighter. So much so that I doubt I will lighten it with white - once the washes go over it they will add some depth to the hue, and the weathering will lift it lighter anyways.. Tip to anyone painting a whole vehicle that doesnt have subassembies. Paint the undercarriage first - the running gear suspension etc. few reasons, one is so that of the pait consistency isnt spot on, any bad spray will be in a an area that should have mud or dust or whatever sticking to it anyways so its well concealed, and secondly, you can hold onto the top while its inverted. once you spray the top half, you can place it on a board and no longer need to hold it - cant do it the other way around. 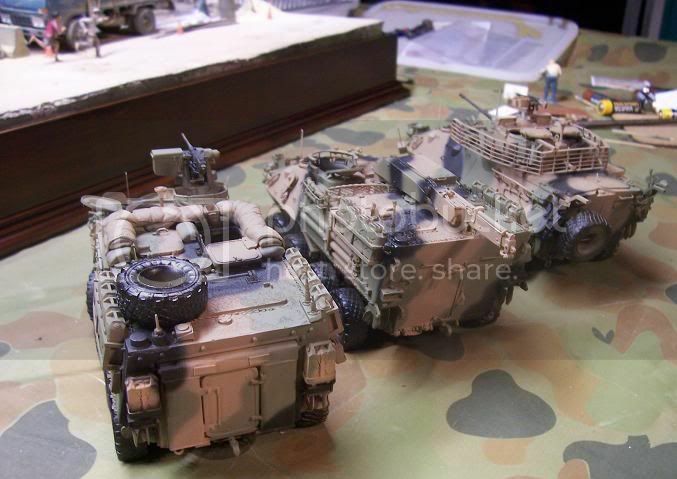 Anyways heres the 3 vehicles with the Mouse armour Paints Ozcam brown. As a side note, test fitted the figures prior to paint. Had to modify 2 of them alot to get to fit and look right. Figures A and B are from the Aslav crew set from Arms Corps models, and they went together real easy and "fit" into the turret rings quite well. I am planning on chopping a spare fig up to extend his torso lower down into the turret as surprising how much cavity there is in there. SO a bit of extra bodywill conceal that nicely. 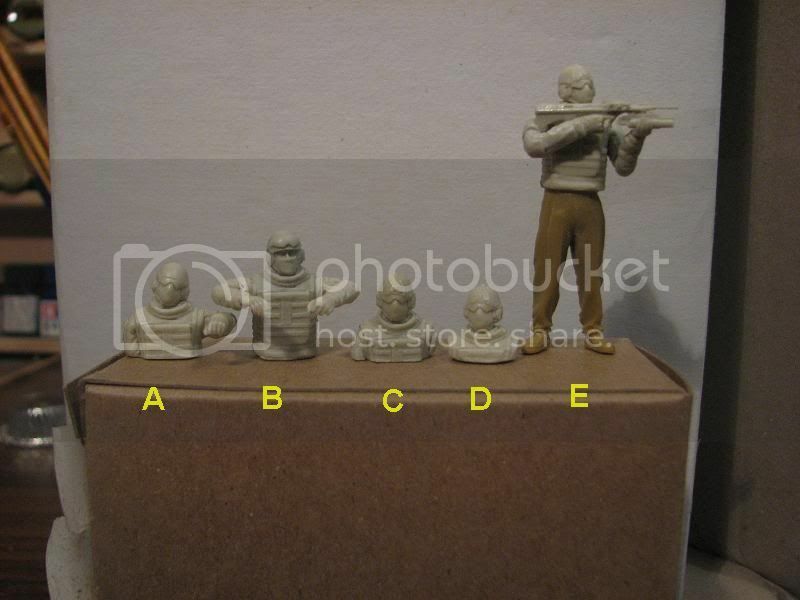 Figures C and D are the same figure from the ASLAV PC crew set, the commander figures (from two sets). 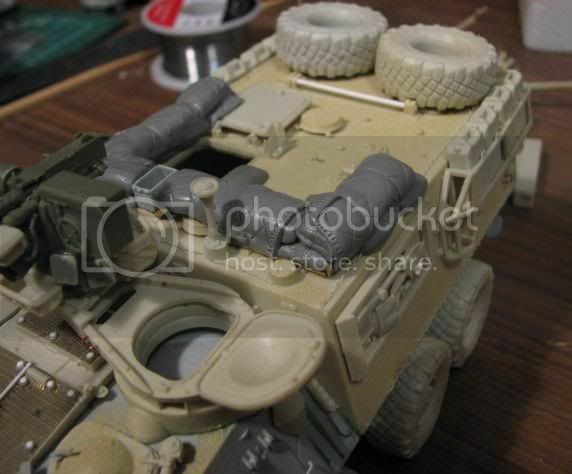 I had to thin down the shoulders of C to make him fit in the PC cupola with the RWS mount. When its at the 3 oclock position its quite narrow across ways and to have him so low in the ring his shoulders were very broad, so slimmed him down some. Figure D was even worse, To fit him in the Fitters cupola ring he had to have his shoulders removed completely and then to hide that, he has to be very low so had to shorten his torso enough that shoulders were below the ring, just his head pops out. I like that as his is least armed vehicle and I'd keep a low profile too.. Figure E is the passenger hanging out back of the pc, he sits very high with his elbows above the deck, No wonder they add the sandbags if this is the way to ride. Because he sa so high, You could see through the hatch and that he sort of stopped below it. So I added some spare legs to extend down. 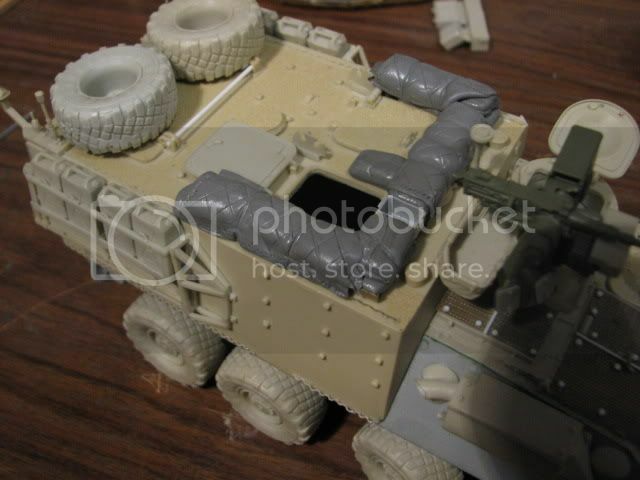 I am thinking I might have to add a couple of greebles to the gun car turret interior - as its obvious there is a cavity below the figs and will need at least the periscope bottoms added, and some sighting equipment etc. Firstly these look brilliant and I am learning some techniques AND some new vendor information too. Really Adam, fantastic work and I am loving the regular updates. Cheers to all you guys who are keeping this forum, and all the other ones too, going. 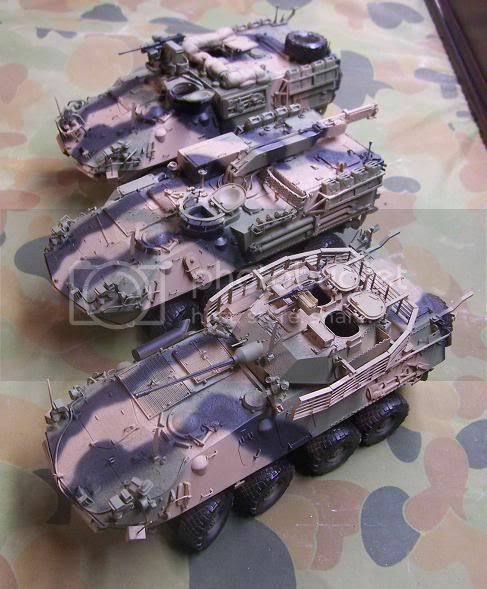 Had I known about armorama back in 2003, I might not have ever left the hobby. HUA! Some overspray and a couple of incorrect pattern placements to be corrected later. Using the Mouse Armour Paints, Ozcam set, LOD. It sprays ok but it dries very quick - need to thin it a little more than usual to prevent cure before hitting model. Also been a while since I sprayed enamels, but had to clean nozzle after each cup. using floquil thinner and brush cleaner as my thinner - All the shops are shut today for Easter Friday and I dont have any general purpose thinners. PS I now know that there is a huge hole in the aftermarket which is accurate and easy to read cam pattern plans. the MH Paints ones are virtually unreadable they are so small. 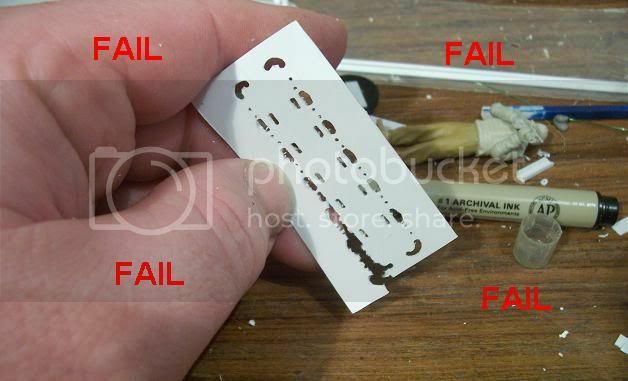 The paint guide in the Echelon decals might be accurate but does'nt have a front view or a topdown view. Finding accurate reference is a challenge. Man three super detailed projects' in one post, Man this is the best thread ever! 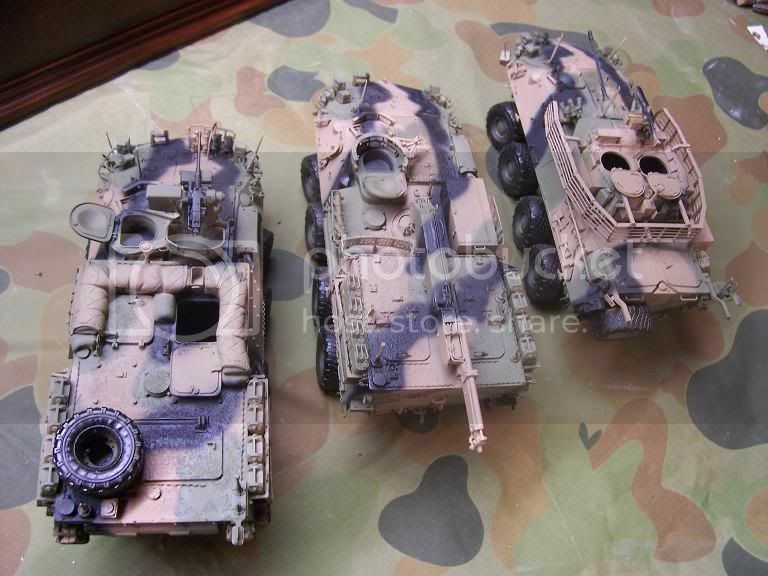 I could be very wrong here and someone feel free to correct me on this, but when I was in the US Army, we just sprayed on the paint and did not really have a "set" plan, more of a loose guide about where and how to place the colour. I am sure there might be a doctrine somewhere about this, but in the "field" that all goes to . . . .
Adam, thank you again for putting all of this up and the Dio blog too. Really superb. Cheers. 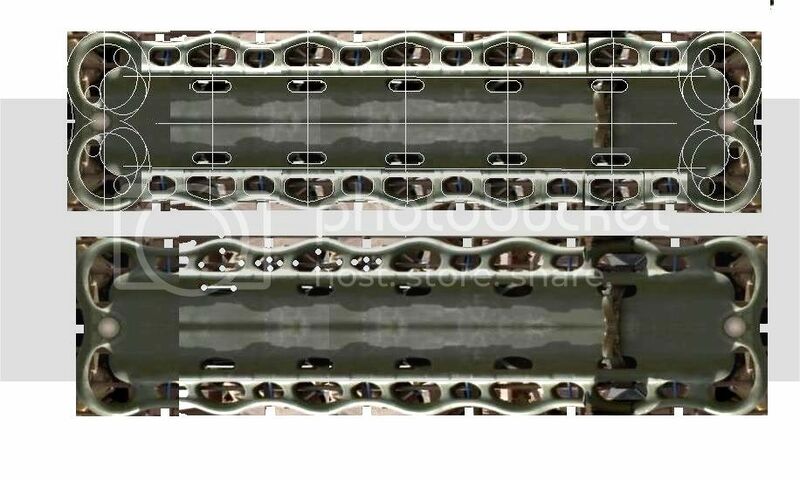 Didge - I am quite certain that the ASLAV cam pattern is factory applied and is extraordinarily specific. The crews in the field are issued with aerosol cans for touch ups, but essentially the cam pattern is factory applied. Interestingly its applied about 15 mins drive from my house! So I have finished placing the three tone Auscam on all three vehicles. Very difficult when I have conflicting references and none of them are really good quality. But I think I have a happy medium. I still have some overspray touch ups and pattern corrections as i discover errors, but will let the paint set proper for a day now. I was having some issues spraying in the garage tonight - its so cold and the dew point is causing moisture in the air to condense in the compressor - the moisture trap was working overtime but wasnt stopping it all and I was getting little moisture pops every few minuites. Very annoying. Had to stop and dry off the model and respray the area..
A note on the Mouse Armour Paint Auscam set, Supposed to use genreal purpose thinners, but I didnt have any anyways and mineral turps worked but really badly, Tamiya enamel thinner was a total fail, but the Floquil thinner and brush cleaner worked quite well. because mineral turps isnt used I am thinking that once set, this paint shouldnt react to a turps based oil wash like normal enamel does.. If thats so it will be a real bonus! No crazed base coats! Fingers crossed. 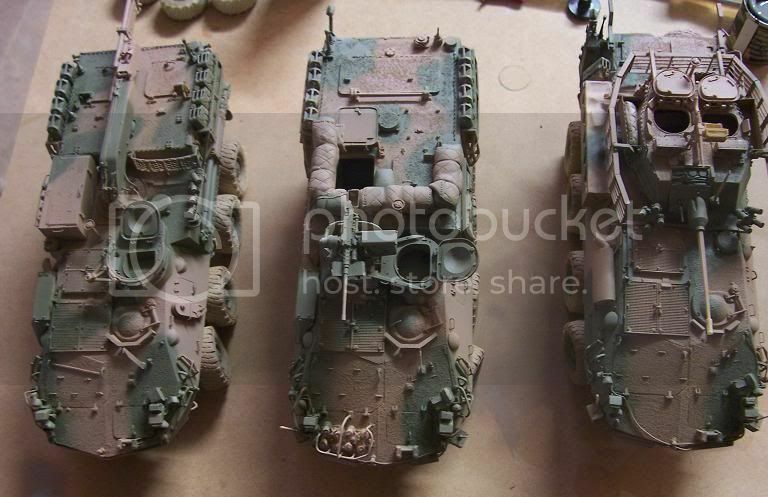 SO heres some pics of the three vehicles ready for the next step - clean up and repair all the bits that break off from handling - nasty nasty stuff that. I have been watching your builds with great interest I really like the tan colour you choose, I have seen others that are far to pale IMHO. I did up this plan so I could understand the cam pattern, have you seen this? I await your weathering and final detailing, a very ambitious project. 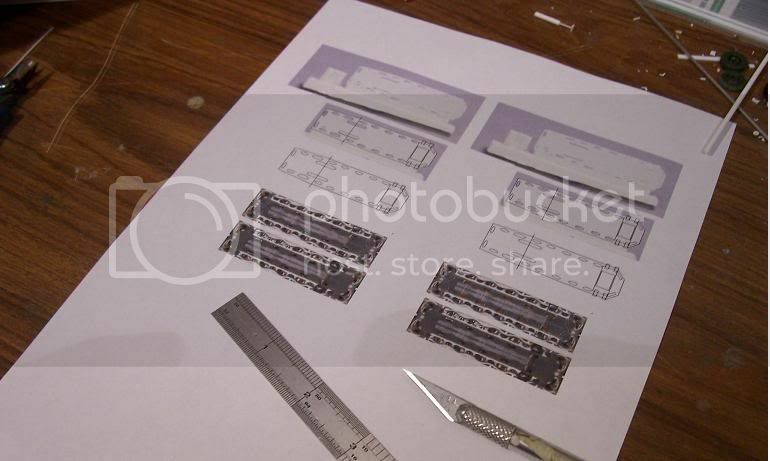 The cam paint by numbers you did was printed out and stuck on the wall next to me the whole time - Possible the single greatest piece of reference i had for the pc and fitters. Thanks for making it. I almost stopped after the green, and started drawing the plans for the vehicles to do what you did but from all angles. What stopped me was once weathered, nearly all the cam is lost and everything will be one flat dusty tone. 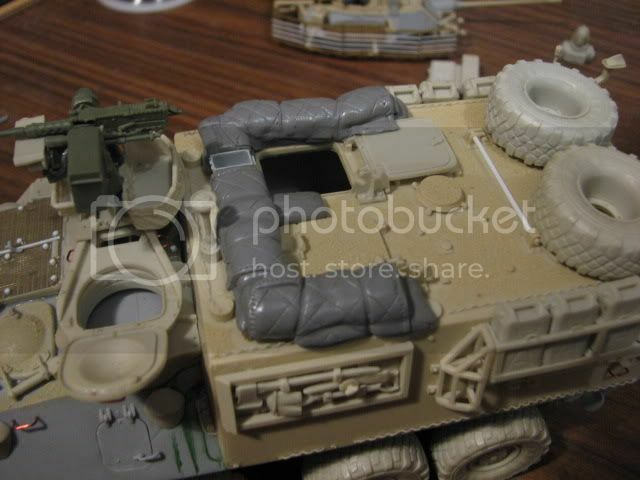 So I know that I'd be wasting time given the level of weathering i wish to aply. . Lots of pics show vehicles that are from the waist down single tone! and from waist up just a shadow of the former pattern remains under the dust. As fr the hard edge - Agreed, but same as for above - once dusting starts that will all be lost anyways. I hope anyway! Thanks by the way - you groudwork from a few years back still has much value today and has in fact been invaluable for my project! Definitely a legacy thread as someone put it. 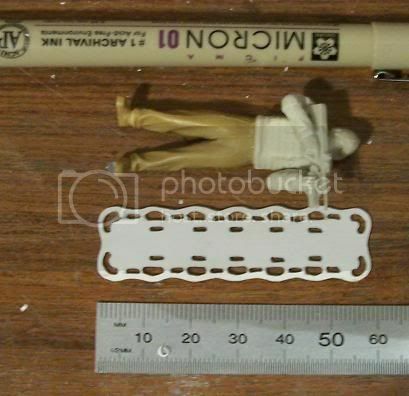 The Tan colour is from the Mouse Armour Paints Auscam 3 pack of enamels pre colour coded. Unlike what you had to do, its all done for me ! Im happy with the results. Agreed and I am happy to have helped in some small way. Your efforts are Herculean, it took me a year to do that one ASLAV and you have a small village and three ASLAV's all kitted out bar armour and all, wonderful to see. Keep up the impressive work. I am not expert to be sure on anything, but I think the paint job looks pretty banging. I think you have captured the look, based on Bill's diagram, spot on. Maybe I am just overwhelmed by the sheer level that you are putting into these but I really think that you took much more time and thought into this than we ever put into our real tracks while in Germany. Keep it up. Cheers. LAV's are looking great Adam! 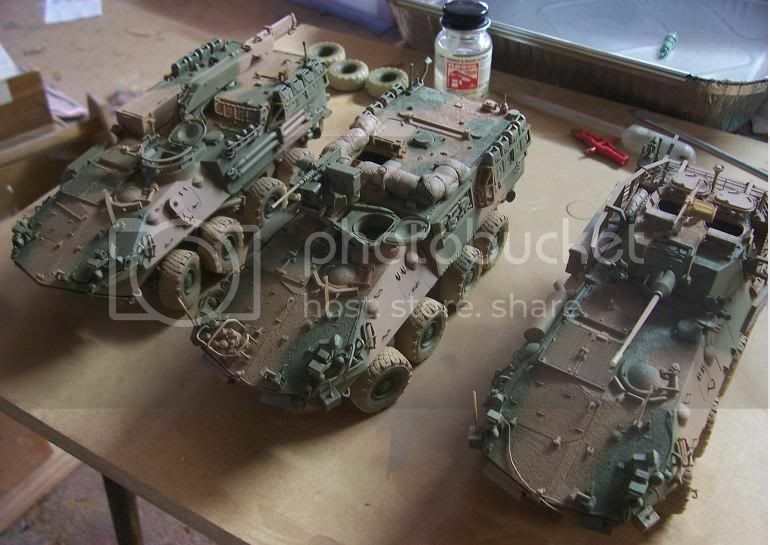 I wouldn't worry too much about the paint being accurate, you are right that all ASLAV's have the same scheme applied to them but when the vehicles are sent out to units and touch ups are done diggers usually don't care to follow the original pattern. 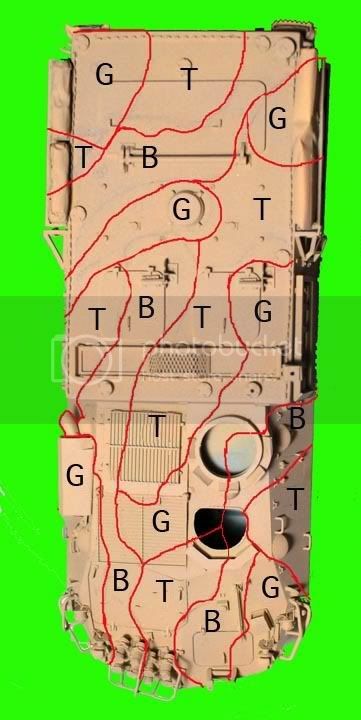 When this happens vehicles can go back through the paint shop every so often and sometimes get resprayed following the lines of the touch up paint instead creating a bunch of one off ASLAV patterns giving modellers headaches. But as you say when you weather them you would be lucky to see any difference below the drivers hatch and not much better above it. 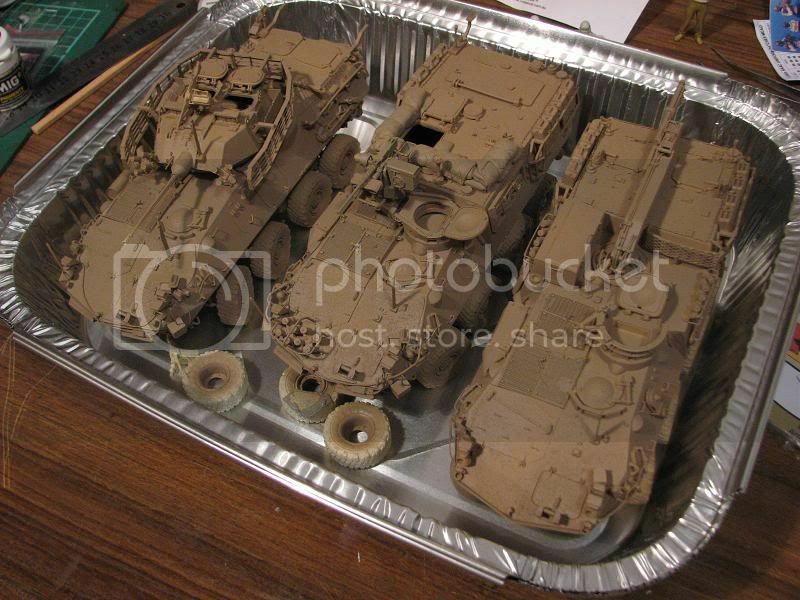 Can't wait to see them weathered! But I gave it a shot anyways. I really want a spine board on the side of my ASLAV PC. What is a spine board you ask ? 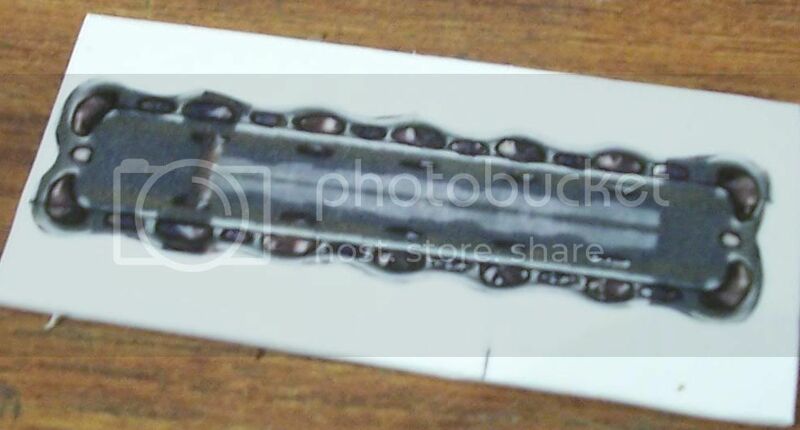 the pictures below will show you ( its a solid stretcher basically). 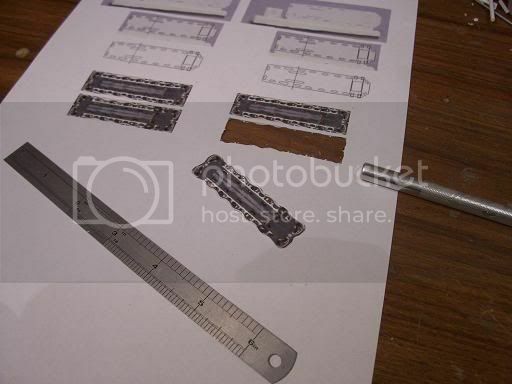 The last pic is my primary reference .. everything will be scratched built off that pic. Now why do I have to scratchbuild one? 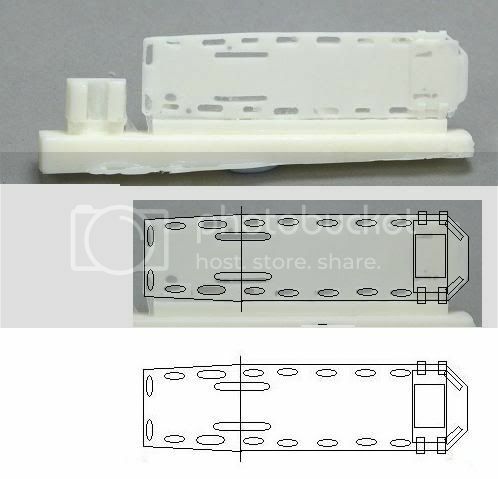 Because the only other spineboard available ( one of the model worlds best kept secrets) is the US variant and can be found in the Pro Art Models Dumvee conversion kit number PAU-35022. Average cost - $75 US dollars. Alot of money for a spine board. Even then, its the wrong shape. 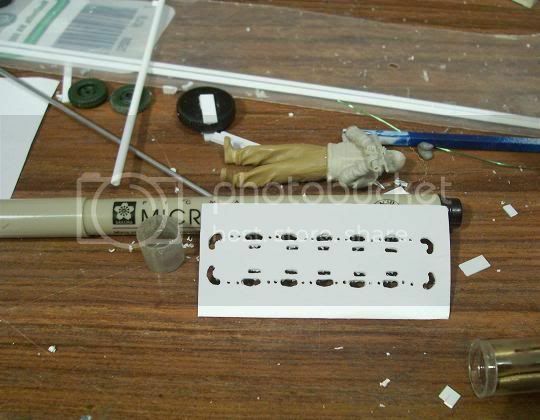 And upon close inspection ofphotos of it on the web - its quality looks basic to say the least. 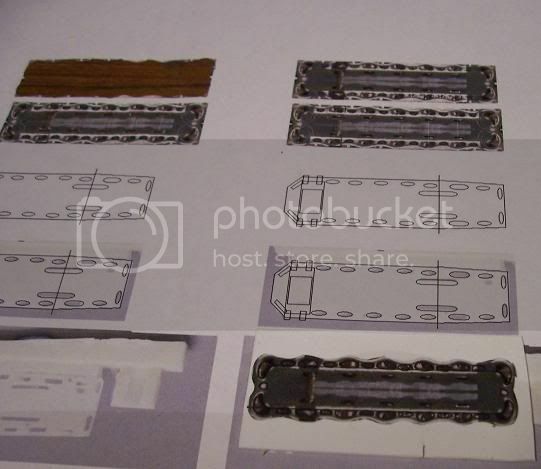 Anyways here is a pic of the pro art model part, and my drawings taken from the pic using microsoft paint and some photo editing in NERO to make a plan of the yankee board. Using that last pic from the ASLAV, And knowing there are 5 handle bumps along the edge not including the ends, I can make the following pictures up. I tidied them as best I could. 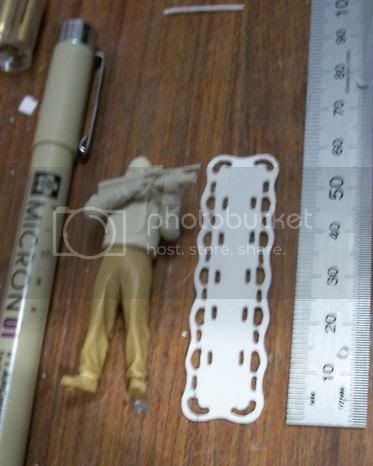 Scaled them to 54mm figure size, and using the length on the picture of how far it stretches across the jerry can racks, I measure it at about 58mm. So once scaled I put the lot on a single page, made some duplicates and printed it out to scale. Now all those grab handles... started to drill them out with a pinvise.. yes this took a few hours. started with 0.5mm drill bit and did the inside handles. Once drilled the slots at the ends.. I drilled in between to clean out the slop. 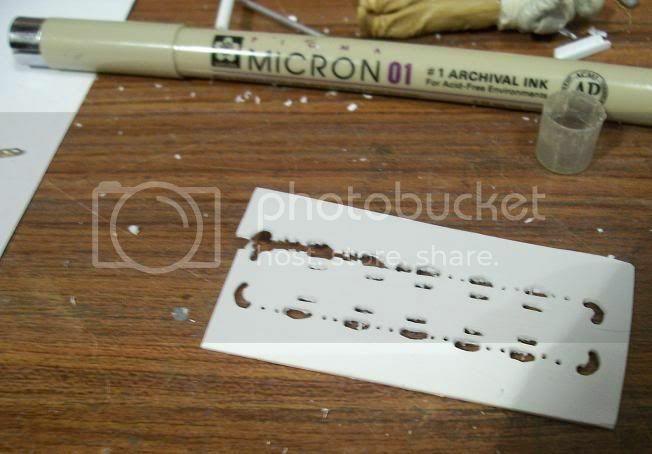 If I had taken more time I would of researched how model submarine builders scratch out those slots on the sides of the ww2 german U-boats.. 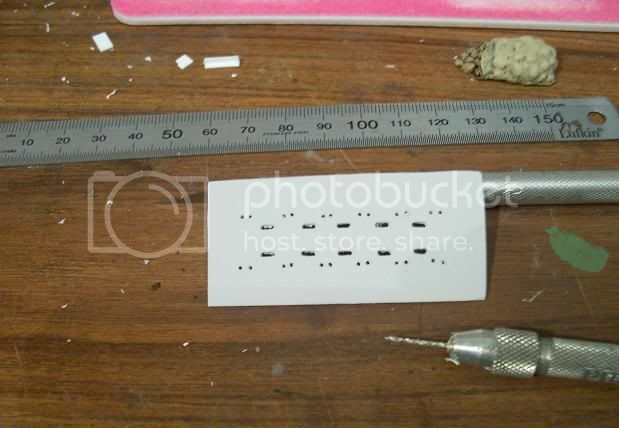 I bet they have a simpler and more accurate way of slotting card. And then CURSE A BLUE STREAK.. man did I swear when this happened. Almost threw it in for the night. 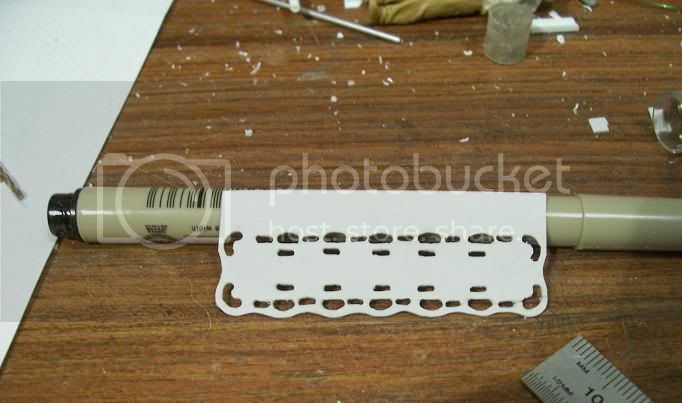 Of course now I think of it by drilling all those holes it essentially perforated the card to a point where it happily snapped. Some of the pieces of card between the slots would be less than half a millimeter so it was about now I realised how fragile this was going to be. The wonders of extra thin super glue.. and zip kicker. I thought gone this far might as well try and finish it for no other reason than learning what else can go wrong if I chose to tackle this again. 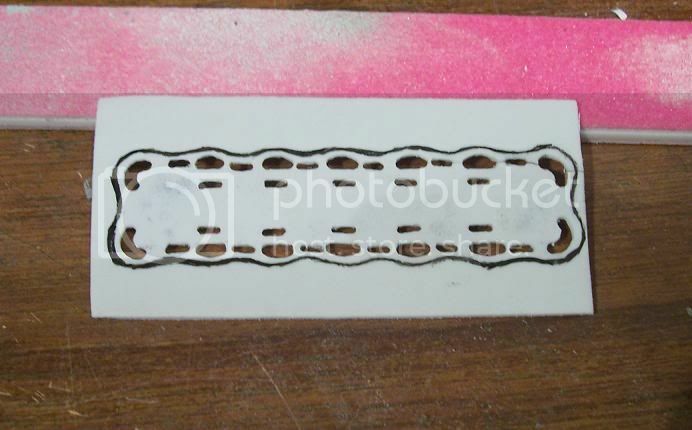 Once all the slots were cleaned up, and this took a while to align them and keep modestly clean, I sanded off the template now, as the fragillity of the board probably wouldnt handle a sanding later when it was trimmed down. Freehand drew the outline with the marker again.. only needed to be a guide at this stage..
started trimming the card back to rounded edges. 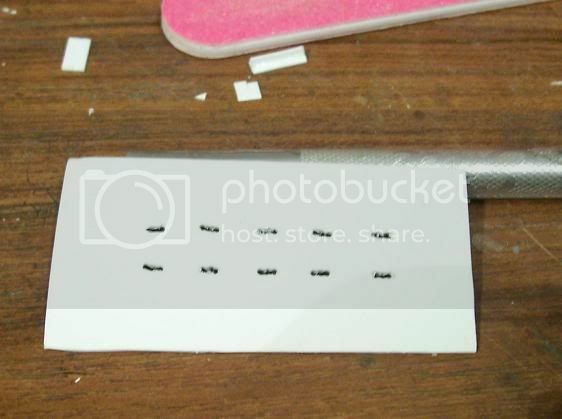 Used sharp knife for trimming, and then a coarse filing stick to shape the rounded edges. The broken plate kept breaking about 4 or 5 times and I had to refit/ reglue. Anwyays, repeating that technique, this is what I have so far. Not too bad, But it needs to have two long ridges running down its spine. Also the handle sides are still "square" and need to be rounded. WIll file them down tomorrow. I have an alternative technique I am thinking of, making the board in 2 parts. 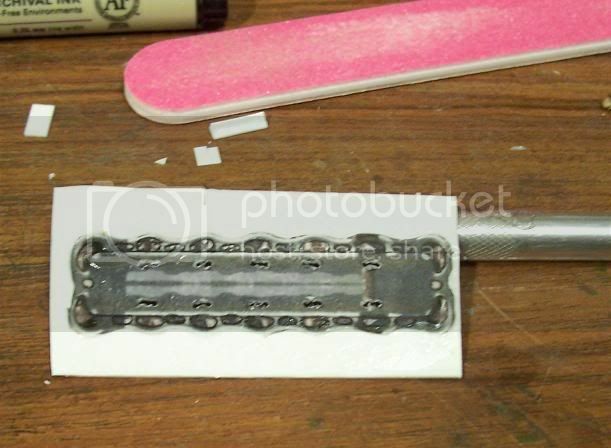 the main plate and the fingers that reach out to the rounded handle could be one part, and made by cutting in from the sides on a scroll saw.. making what I guess would look like a double sided key? 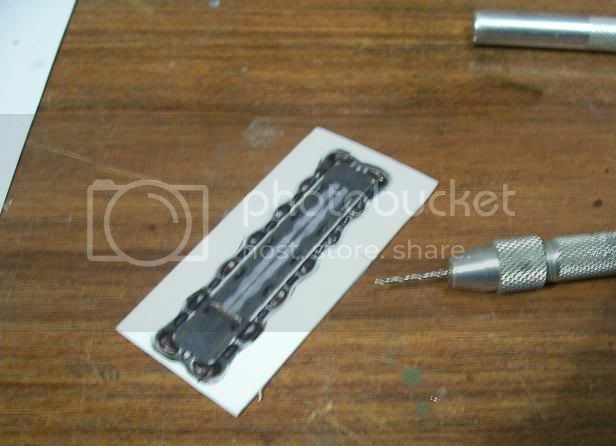 Then use a piece of 1.2mm solder and work way around the board attaching it as the handle. would be stronger, but would be a a bit more finicky ... but might produce a more pleasing result. Anyways.. theres my proper blogging for the night. Its ANZAC day and dawn service in few hours..